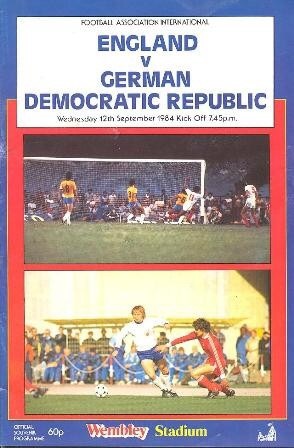 In September 1984, an otherwise forgettable friendly between England and East Germany at Wembley was brought to life in the closing stages. Captain Bryan Robson memorably crashed in a tremendous volley to settle the match and we’ll mark the anniversary this weekend by looking back at that moment. Whenever there are grumblings these days about occasional ‘low’ turnouts for England matches at Wembley (of say 50.000), it’s worth recalling how history has shown they could be a hell of a lot worse. During the nadir of the mid-1980s crowds below 25,000 were recorded on several occasions, with East Germany’s visit early in the 1984-85 campaign seeing just 23,951 show up. But even that figure was disputed, with several newspaper reports the following day saying the attendance seemed lower. BBC commentator John Motson told viewers England were unable to move such games to club grounds due to being contracted to play at Wembley – an issue that persists today. The low crowd made for a subdued atmosphere, as England played their final friendly before embarking on attempting to qualify for the 1986 World Cup. Goalscoring had been a problem in recent matches for England, with the failure to qualify for the 1984 European Championship in France still fresh in the mind. Promising defender Mark Wright was handed his debut, joining Southampton team-mates Peter Shilton and Steve Williams in the starting line-up. Shilton had made his England debut against the East Germans – or the German Democratic Republic as the match programme called them – on their previous visit in 1970 and this would be the final meeting of the sides before Germany was reunified in 1990. Watford’s John Barnes took his place in the side buoyed by his wondergoal against Brazil in the summer, although he would struggle to make a similar impact here. Williams came close to opening the scoring early on as he was denied at the end of an impressive England move, while at the opposite end Joachim Streich marked his 100th cap – in the days when that was still a rare achievement – by striking the woodwork. And bar the odd half chance and East German free-kick that was pretty much all of note in the opening 80 minutes, as the game seemingly meandered towards an inevitable goalless draw. 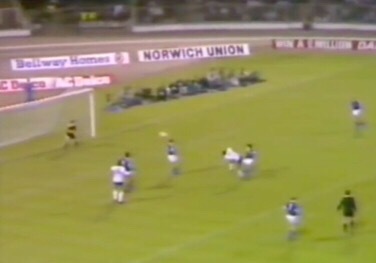 The goal would soon be featuring in the opening titles for Match of the Day and later be included in the BBC’s 101 Great Goals video. The FA website says it was probably Robson’s best goal for England. Although it may not be recalled as frequently as his first minute goal against France in the 1982 World Cup or win him the BBC’s Goal of the Season competition (he did so the following season with his equaliser for England against Israel), it was certainly spectacular. On many occasions during the 1980s both England and Manchester United turned to their captain to pull them through and this was one such occasion. Robson had come up with the goods at the right moment. It was the only goal and meant the captain’s namesake and manager received a better reception at the end than after the previous home match against USSR in June, when he had faced calls for his departure. Not that everyone in the media was entirely happy. Stuart Jones in The Times appeared to have written most of his report before the goal, barely making anything of Robson’s strike and instead singling out Wilkins for praise. Jones reflected grimly on a match which he felt was “devoid of atmosphere, of excitement and even of significance”. It was only a friendly, but Bryan Robson’s winner had provided a chink of light on a night that was otherwise better best forgotten. As Bobby Robson reflected in his World Cup Diary covering his first four years in charge on the East Germany victory: “I was delighted for, apart from starting the new season with a victory, it was important that we should win at Wembley after two defeats in our previous three fixtures there. I had been worried that he squad might develop a phobia about playing on their own ground and that would have been a disastrous disadvantage to take into the World Cup [qualifiers].” England duly qualified comfortably and they did not suffer another home defeat until 1990.